Stephen William Hawking, CH, CBE, FRS, FRSA (born 8 January 1942) is an English theoretical physicist and cosmologist, whose scientific books and public appearances have made him an academic celebrity. He is an Honorary Fellow of the Royal Society of Arts, a lifetime member of the Pontifical Academy of Sciences, and in 2009 was awarded the Presidential Medal of Freedom, the highest civilian award in the United States. Hawking's key scientific works to date have included providing, with Roger Penrose, theorems regarding gravitational singularities in the framework of general relativity, and the theoretical prediction that black holes should emit radiation, which is today known as Hawking radiation (or sometimes as Bekenstein–Hawking radiation). Stephen Hawking was born on 8 January 1942 to Dr. Frank Hawking, a research biologist, and Isobel Hawking. He had two younger sisters, Philippa and Mary, and an adopted brother, Edward. 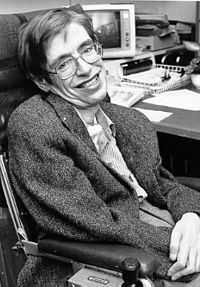 Though Hawking's parents were living in North London, they moved to Oxford while his mother was pregnant with Stephen, desiring a safer location for the birth of their first child. (London was under attack at the time by the Luftwaffe.) According to Hawking, a German V-2 missile struck only a few streets away. After Hawking was born, the family moved back to London, where his father headed the division of parasitology at the National Institute for Medical Research. In 1950, Hawking and his family moved to St Albans, Hertfordshire, where he attended St Albans High School for Girls from 1950 to 1953. (At that time, boys could attend the Girls' school until the age of ten.) From the age of eleven, he attended St Albans School, where he was a good, but not exceptional, student. When asked later to name a teacher who had inspired him, Hawking named his mathematics teacher Dikran Tahta. He maintains his connection with the school, giving his name to one of the four houses and to an extracurricular science lecture series. He has visited it to deliver one of the lectures and has also granted a lengthy interview to pupils working on the school magazine, The Albanian. After receiving his B.A. degree at Oxford in 1962, he stayed to study astronomy. He decided to leave when he found that studying sunspots, which was all the observatory was equipped for, did not appeal to him and that he was more interested in theory than in observation. He left Oxford for Trinity Hall, Cambridge, where he engaged in the study of theoretical astronomy and cosmology.